I am starting a website community of Poets with a dark side. Turning dark cracks & broken fragments into golden seams of poetry ~ A Society of Poets who can turn the dark edges, the cracked pieces and the broken fragments of their experience into the golden seams of poetry. The poets I am looking for write their poetry with a dark slant, twist. The poetry can be metaphysically/literally/figuratively/emotionally dark. It can be themed to a genre – ie paranormal/horror/suspense or it can be personal struggles/pain. This will be a community of shared poetry and eventually I would like to publish some poetry anthologies of the poetry shared. I am recruiting members here. If you are interested, please let me know in the comments on this post. I was very excited to open my inbox yesterday and receive my Author’s Copy of Tales for Canterbury. 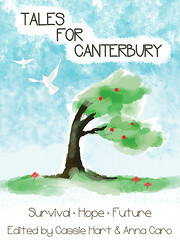 Tales for Canterbury is a short story anthology loosely themed around survival, hope and the future. All profits of this anthology will be donated to the Red Cross Earthquake Appeal for the efforts in rebuilding Christchurch,New Zealand after the disastrous earthquake in February 2011. The anthology is released in May 2011 in electronic and paperback formats. It features stories by RJ Astruc, Philippa Ballantine, Jesse Bullington, Anna Caro, Cat Connor, Brenda Cooper, Debbie Cowens, Matt Cowens, Merrilee Faber, AJ Fitzwater, Janis Freegard, Neil Gaiman, Cassie Hart, A.M. Harte, Karen Healey, Leigh K Hunt, Lynne Jamneck, Patty Jansen, Gwyneth Jones, Tim Jones, Kim Koning, Jay Lake, Helen Lowe, Kate Mahony, Tina Makereti, Juliet Marillier, Angel Leigh McCoy, Linda Niccol, Ripley Patton, Simon Petrie, Grant Stone, Jeff Vandermeer, Mary Victoria and Sean Williams. Orders are now available from Random Static Press. Along with 33 other authors’ stories, my debut short story – The Ring of Fire – has been published and released in an online e-book format. The anthology will also be released in print format very soon. I am also proud to say my friend and CP – Leigh K Hunt – also debuts her first short story in this anthology. If you have not already got a copy, I urge you to go to the site and get one. Not only is it an amazing compilation of short stories by very talented authors but you will also be giving towards a great cause. It is a Win-Win on all accounts. Table of Contents – Hope | Tales for Canterbury. My first short story will be published in the upcoming month in an amazing anthology of short stories called Tales for Canterbury. This is a project that I am proud and honoured to be a part of. Firstly it is a wonderful selection of stories by very talented authors. Secondly it is a project dear to my heart personally as not so long ago I called Christchurch, New Zealand home. So to be able to be part of a project that honours Christchurch and raises funds for the Red Cross is very special to me. Each part has stories that are themed around one of these three parts. My story, Ring of Fire, is set in the Theme of HOPE. When I was first invited to submit for this anthology I was only given these 3 key themes and told that the story needed to encapsulate either one of these three or could be a combined theme of all three. I was also told that it needed to be a fantasy-based story. At first I pondered on these three themes for about a week or two. I realised that these three themes are core themes of the human drama we face in all cultures. I also felt a kinship with these themes as these are the themes in most of my own writings from my poetry to prose to novels. I believe in Survival, Hope and Future. But for me the greatest of these three is HOPE. For without hope it is difficult to survive and without hope it is impossible to conceive a future out of that survival. So I knew that I had chosen a theme that not only was the basis for the other two themes but something I desperately believe makes all the difference in our lives as human beings: HOPE. Did I have a story in mind? Not immediately. But the story found me. Or rather my MC found me and told me her story. Within a few days I had the story in front of me. I was ready to compile it and submit it through to Tales for Canterbury. This story is unlike any of my other stories but the theme and premise is the same that threads its way through all my stories. The character was a challenge for me as it was a different POV than I am used to writing in. But the story weaved itself out onto the page and before long I knew I had a “quilt” of hope, survival and future in MS form. This story is set in a dystopian world and centres on one Main Character who against odds is forced to be a Survivor. This MC is similar to my other MCs in that looking at the MC you see a vulnerable character who does not quite fit in with anyone or anything. Two terrible crises brings the inner strength of this character to the light and hope shines through a dark time. The story is told through the voice and perspective of the MC. As this character experiences danger and is thrown into a fight for survival, so you the reader will feel the same fear, doubt, flight/fight response, rallying strength and refusal to give up and in the end pure HOPE: the lifeblood that gives her strength to see a future that is brighter than what has gone before. It is wonderful when a character is able to capture your heart. I believe this character will capture your heart as mine was captured. I believe in this story and I believe in this MC. But more than that I believe in the underlying message that threads its way through the story. It is not only the strong that survive. Sometimes it is those that seem most vulnerable that shine in sheer strength when their soul is tested by great trials. Sometimes vulnerability and innocence are just masks for a pure and noble spirit. In times of great conflict and drama, these masks fall away and the true spirit of strength shines though. Sometimes all a person/character needs is hope and a reason to fight for survival. Give them both and you have a warrior that is pure and strong in heart. That is Ring of Fire. What is Tales for Canterbury? Tales for Canterbury is a short story anthology loosely themed around survival, hope and the future. All profits of this anthology will be donated to the Red Cross Earthquake Appeal. The anthology will be released in April/May 2011 in electronic and paperback formats. It features stories by RJ Astruc, Philippa Ballantine, Jesse Bullington, Anna Caro, Cat Connor, Brenda Cooper, Debbie Cowens, Matt Cowens, Merrilee Faber, AJ Fitzwater, Janis Freegard, Neil Gaiman, Cassie Hart, A.M. Harte, Karen Healey, Leigh K. Hunt, Lynne Jamneck, Patty Jansen, Gwyneth Jones, Tim Jones, Kim Koning, Jay Lake, Helen Lowe, Kate Mahony, Tina Makereti, Juliet Marillier, Angel Leigh McCoy, Linda Niccol, Ripley Patton, Simon Petrie, Grant Stone, Jeff Vandermeer, Mary Victoria and Sean Williams. We are so excited to have pre-orders open! Check out our new page “Get Your Copy!” or go straight to the source and head over to Random Static. The print copy is priced at NZ$24.95 (including postage within NZ) and the digital version is a mere NZ$12.00! At those prices, you might as well pick one up for a friend too. This week has been an amazing week in so many ways. It started off with my birthday where I was spoilt by the special people in my life..those that I am privileged to call family and friends. But then the week got even better. A couple of weeks ago a writer friend connected me with an editor in New Zealand who wanted to put together an anthology of short stories from different authors with the common theme of Survival, Hope and the Future. All proceeds would be donated to the Red Cross for the Christchurch 2011 earthquake appeal. After talking to the editor about what they were looking for, I was invited to submit a short story. I finished the story and submitted it on the 21st of March. On Monday this week I had the wonderful email that told me they loved my story and with a few edits they wanted to include it in the anthology. Today my publishing contract arrived which really brought it home to me. I am very excited, honoured and privileged to be published in this incredible anthology. This anthology is especially dear to my heart as Christchurch was once home to me a few years ago and I have many close friends who still live in Christchurch. So to be able to be part of a project that gives back to the city of Christchurch and helps in some small way to rebuild that courageous city really fills my heart with tremendous joy. The anthology is called Tales for Canterbury. Below are details of the blog that has been set up by the editors for this anthology as well as a list of all the authors that are contributing. I have also included a link to the pre-order site of the anthology. The anthology will be available in both E-book format and Paperback format. 100% of all proceeds are going to the Red Cross for the Christchurch Earthquake Appeal. There are going to be well over 2 dozen stories in this anthology by both New Zealand authors and international authors. This is an opportunity for readers everywhere to be able to support the community of Christchurch who have shown such resilience and courage in the face of a huge calamity. Instead of falling down, they have stayed strong determined to rebuild their community and their city. Thank you once again to the editors of Tales for Canterbury for firstly inviting me to submit and finally for the great honour of accepting my submission for contribution. For Christchurch, a city always dear to my heart – Stand Strong and Stand Tall. Tales for Canterbury « Parchment Place. What an Amazing contribution and idea to help support Christchurch in her time of need. Thank you Cassie and all the other people who are helping to put this together. I spent 6 months living in this beautiful city. Christchurch and the generous, courageous spirit of the people of Christchurch will always have a special place in my heart. This is a city built on faith, strength and fortitude. Two days ago the foundations at the core of this city shook and Christchurch underwent another massive natural disaster just 6 months after the earthquake in September 2010. Where many other people of cities would have fled for the hills caring only for the safety of their own, Christchurch has banded together with the courage and generosity particular to the Cantabrians and helped one another. Strangers are taking the time to search for missing people and other strangers are taking in homeless people. This is a city that may have been shaken to fall on her knees but she is not down and she is not defeated. Christchurch will persist in getting to her feet and rebuilding the city that is so dear and near to so many hearts. The news coverage throughout the last few days has portrayed stories of ordinary people turned heroes and of selfless strangers doing everything in their power to help their neighbour, their friend, a stranger. The people of New Zealand and the world who watch stand in awe of the stoic courage and hope that the Christchurch people have shown in the face of great calamity. “Be merciful to me, O God, be merciful to me! For my soul trusts in You; and in the shadow of Your wings I will make my refuge, until these calamities have passed by.” (Psalm 57:1) Lifting up Christchurch in prayer tonight…May your strength and hope shine through and may it be a beacon to the rest of us. May God be with you all. May the Lord still the earth beneath your feet. May He strengthen your foundations. 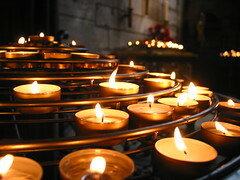 May those that are trapped be sheltered under the Lord’s wings and kept safe til they can be rescued…May those who are waiting to hear be comforted and strengthened…May those who are scared be encouraged to know that many, many prayers are being lifted up for your city in this hour of her need. And a special prayer for strength and endurance for those brave rescuers amongst fire-fighters, paramedics, police, military, medical staff and good Samaritans. Christchurch – May God be your foundation as the ground’s foundations tremble beneath your feet.